Sometimes I am pretty cavalier about my unusual family situation. I can find myself telling some stranger on the street, "oh, no, my partner is a man, my husband. I don't have a wife. I'm actually transgender. I birthed my baby myself, and I can even breastfeed him some. Great, isn't it?" If I have plenty of time, and I feel safe, I'm pretty willing to explain what we've done. Most people respond very well, with mild curiosity or amusement. 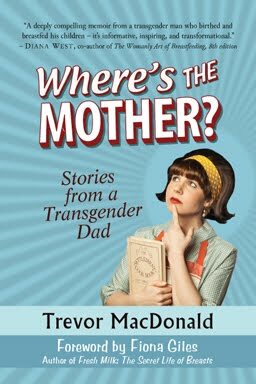 Sometimes though, it just isn't the right moment to get into explanations about how transgender folks give birth. One evening Jacob had just fallen asleep in a coffee shop and we needed to get going when somebody asked us if we used a surrogate. Neither Ian nor I like to lie about anything, so we kind of mumbled something confusing yet agreeable and walked away. "Ah, yes, isn't it wonderful that people can do that nowadays? Well, we have to go!" On another occasion we were eating at our favourite restaurant in Winnipeg, a small, family-run Ethiopian joint downtown. We had our wedding dinner there, and we love the friendly staff. However, communication is a considerable challenge due to the language barrier. I thought I'd booked the dinner only to find out a week before our wedding that the restaurant had no record of the event. Luckily, they hadn't booked anything else either, so I simply booked again, this time in person. The actual day went well except for that there had been a misunderstanding over the number of guests, and there weren't enough chairs for everyone. Then the restaurant Momma forgot to include samosas on our bill and we didn't notice either. Weeks later, she mentioned it to us while her son pleaded with her to forget about it. We apologized and paid for what we'd had. So, after all this, Ian and I both instinctively felt that there was no way we could successfully explain the origin of our child, even though I'm sure the well-meaning restaurant owner would have been delighted to hear all about it. She cooed over Jacob for a good five minutes. Then she asked, "So, you get him in Canada, then? Or international?" She was assuming that Jacob was adopted. Ian responded quickly, saying, "yes, he is a local Winnipeg boy!" The restaurant Momma approved heartily. "Very good, very good," she said. "Have a good night! See you again soon!" I vowed that the next time I saw her son with his much better grasp of English, I'd explain everything to him and ask him to tell his mother in their language. Very intresting blog to read,thanks for sharing.